Equality. In printed books before the modern equal sign, equality was usually expressed with a word, such as aequales, aequantur, esgale, faciunt, ghelijck, or gleich, and sometimes by the abbreviated form aeq (Cajori vol. 1, page 297). The equal symbol (=) was first used by Robert Recorde (c. 1510-1558) in 1557 in The Whetstone of Witte. 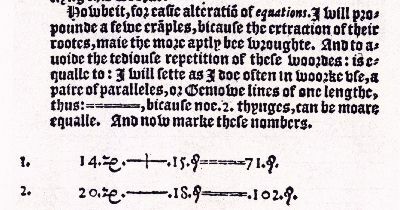 He wrote, "I will sette as I doe often in woorke use, a paire of parralles, or Gemowe lines of one lengthe, thus : ==, bicause noe 2, thynges, can be moare equalle." Recorde used an elongated form of the present symbol. He proposed no other algebraic symbol (Cajori vol. 1, page 164). Here is an image of the page of The Whetstone of Witte on which the equal sign is introduced. The equal symbol did not appear in print again until 1618, when it appeared in an anonymous Appendix, very probably due to Oughtred, printed in Edward Wright's English translation of Napier's Descriptio. It reappeared 1631, when it was used by Thomas Harriot and William Oughtred (Cajori vol. 1, page 298). A manuscript, kept in the Library of the University of Bologna, contains data regarding the sign of equality (=). These data have been communicated to me by Professor E. Bortolotti and tend to show that (=) as a sign of equality was developed at Bologna independently of Robert Recorde and perhaps earlier. Cajori elsewhere writes that the manuscript was probably written between 1550 and 1568. Less than and greater than. The symbols < and > first appear in Artis Analyticae Praxis ad Aequationes Algebraicas Resolvendas (The Analytical Arts Applied to Solving Algebraic Equations) by Thomas Harriot (1560-1621), which was published posthumously in 1631: "Signum majoritatis ut a > b significet a majorem quam b" and "Signum minoritatis ut a < b significet a minorem quam b." According to Johnson (page 144), while Harriot was surveying North America, he saw a native American with this symbol on his arm: . Johnson says it is likely he developed the two symbols from this symbol. We now know that Harriot was not directly responsible for the Praxis, which was put together after his death from papers which are no longer extant by Walter Warner (and, perhaps, one or two others), when Nathaniel Torporley had failed to complete the task which had been assigned to him in Harriot's will. Torporley was a respected mathematician of the day, reputed to have been associated with Viéte himself. The manuscripts that we do have (in the British Library and Petworth) cannot have been the origin of the Praxis, not only on account of their disorder and incoherence, but also because there are significant differences between them and the published work. Notably, the inequality signs associated with his name are never found in his handwriting in the manuscripts but appear throughout as and . Similarity, equality is denoted in the manuscripts by II and not by = (the sign introduced by Robert Recorde), as in the Praxis. The significance of the inequality signs lies in the fact that this is the first time that such signs were used and accorded the same status as the equality sign. Less than or equal to, greater than or equal to. Pierre Bouguer (1698-1758) used and in 1734 (Ball). In 1670, John Wallis used similar symbols each with a single horizontal bar, but the bar was above the < and > rather than below it (Cajori vol. 2, page 118). Cajori apparently does not show a use of the modern symbols with the single horizontal bar. Is nearly equal to. The symbol was used in 1875 by Anton Steinhauser in Lehrbuch der Mathematik, "Algebra" (Cajori vol. 2, page 256). The same symbol was used in 1832 by Wolfgang Bolyai to signify absolute equality (Cajori vol. 1, page 307). Proportion. The symbol :: was introduced by William Oughtred (1574-1660) in Clavis Mathematicae, composed about 1628 and published in London in 1631. He wrote a proportion as a.b::c.d (Gullberg). The astronomer Vincent Wing (1619-1668) used colons to write a proportion in the modern notation, as A:B::C:D, in 1651 in Harmonicon Celeste (Cajori vol. 1, page 286). The symbol for variation (an eight lying on its side with a piece removed) was introduced in 1768 by W. Emerson in Doctrine of Fluxions (3d ed., London) (Cajori vol. 1, page 297). This page is translated to Romanian here. This page is translated to French here.